The most unusual projects arise, if the fun factor is high and reason plays a minor role. A good example is this GLE 63 Coupé, which not only differs externally from the production model. 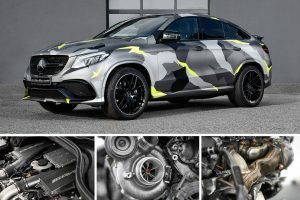 Among the spectacular urban camouflage wrap, hides the modified heart of the SUV, the 5.5-liter bi-turbo charged V8 engine. This has been completely revised and was equipped with reinforced components. In addition to forged pistons, H-shaft connecting rods and bearing shells, the V8 engine received the MC900 upgrade turbochargers, mcpipes exhaust manifold and an exhaust system with catalytic converter. Ultimately were the ECU and TCU carefully tuned with mcchip-dkr software on the in-house dyno. The complex engine conversion makes the GLE to a four-wheel drive behemoth with remarkable power output of 909 hp and 1096 Nm of torque. Compared to the stock power, this means an extra power of 352 hp and 396 Nm. The MC900 kit can also be used on all other AMG models with 5.5 liter V8 engine (M157).